How do Law Enforcement agents obtain COMINT on targets in motion? Using our "Off the Air" Cellular Intercept feature, monitoring a cell phone while it moves in between cells is possible. When cellular communication signals attempt to connect to the local service provider, our Off the Air interception causes the target to gravitate toward our cellular surveillance system. Thanks to this feature, Law Enforcement agents can acquire COMINT of voice and data on sought after criminals and suspected terrorists. In some countries, Law Enforcement still has to go to the service provider and manually tap the calls of their suspects. No more, with our Off the Air Cellular Intercept! Because of our "Off the Air" features, Law Enforcement is not tethered to the phone company, but free to pursue suspected criminals and terrorists using our mobile interception hardware. 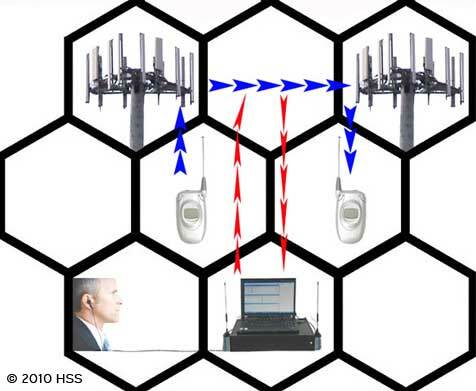 For more information on HSS Cellular Intercept System used by and for Law Enforcement, with Off the Air functionality, Contact Us.